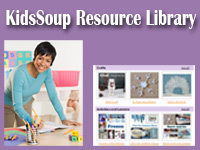 Samples of our over 100 flower preschool and kindergarten crafts, activities, games, and lesson plans available inside our KidsSoup Resource Library. 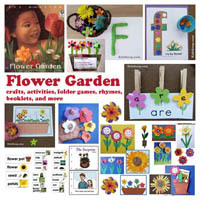 Add some brown fabric or felt, silk flowers, toy garden tools, and seeds to your block center. 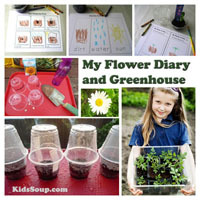 Let children create garden beds and plant flowers. Make a flower stand. Provide shoeboxes, plastic vases, silk flowers, a cash register, pictures of flowers, and wrapping paper. 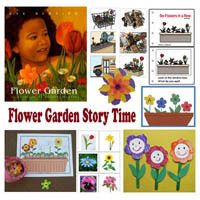 Let children pretend to be a flower shop and selling flowers to their customers. Place moist sand in your sand table together with silk flowers, sunflower seeds, plastic gardening tools, a watering can, and garden gloves. 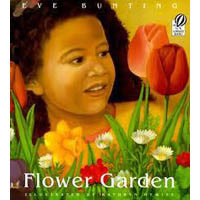 Let children plant a flower garden. Soon we'll have dandelions everywhere! 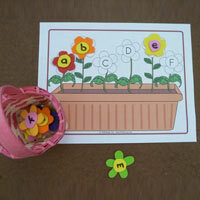 Print the Flower Life Cycle cards and place on the board. Talk about the life cycle of a flower. Let children roll into a ball pretending to be a seed. 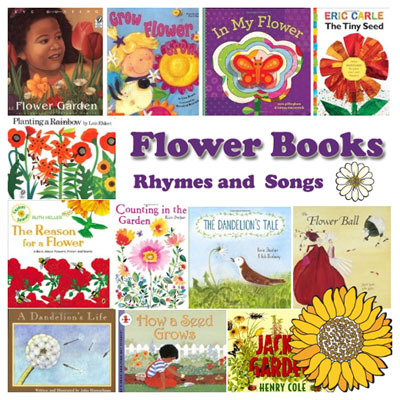 As you play soft music let children slowly grow in to a flower, and then sway in the wind and look up to the sun. 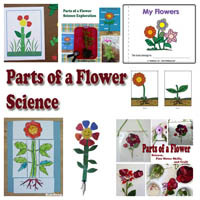 Explain to children that a flower or any plant has different parts: roots, stems, leaves, flowers, and seeds. Flowers produce seeds that can grow into new plants. Flowers have parts on the outside (petals) and the inside (ovule, pistil, stamen, stigma). Flowers will wilt, dry out, and die if they are uprooted from the soil. Cut flowers survive in just water, but only for a few days. 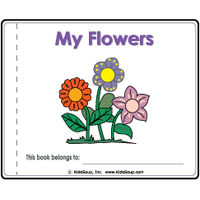 Show children a flower, such as a daisy or carnation, with roots attached. 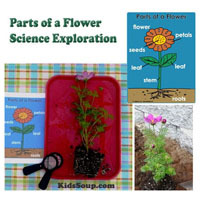 Ask children, "Can anyone name the parts of a flower?" Point to the petals or flower of the plant and ask, "What are these called?" Explain to children that the flower has parts on the outside (petals) and the inside (ovule, pistil, stamen, stigma). 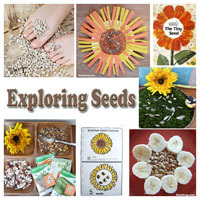 Explain to children that flowers produce seeds that can grow into new plants. Point to the leaves and say, "Leaves are the plant's food factory. The flower makes food from sunlight. It's called photosynthesis. The stem is the plant's drinking straw. With the roots the stem helps bring water to all parts of the plant." 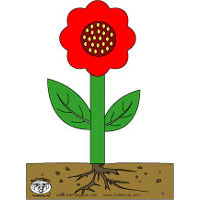 Point to the center of the flower and explain that flowers make the seeds that grow into new plants. Last, point to the roots and explain that the roots hold the plant in place. Plants need water to live. They take it in through their roots. The water travels through their stems to the veins in their leaves up to the flower. Fill a tall flower pot or with sand. Print and cut flower shapes out of construction paper. 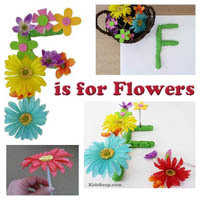 Decorate the flowers and attach a craft stick to each flower. Write the numbers 1-10 on the flowers. 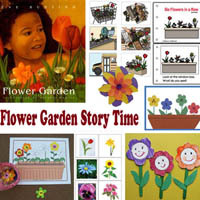 Let children plant the flowers in order from 1-10. 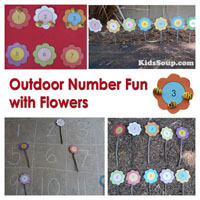 Print the flower number cards 1-10 and cut out. Place the cards face down on the table. 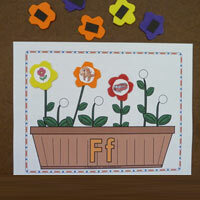 Let children turn over a card and plant the matching number of flowers inside their flower pot. 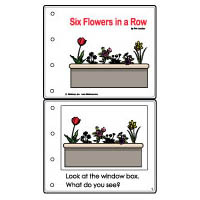 If two children are playing ask, "Which flower pot has more flowers?" 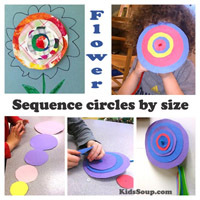 Cut our flower shapes out of three different colors of craft paper. 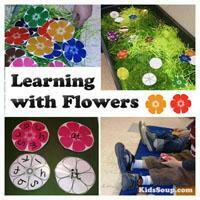 Let children copy and create flower patterns. 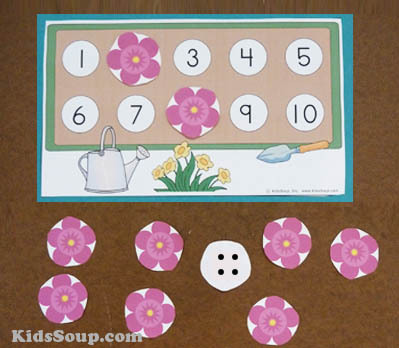 Print out our flower pots mat with the number 1-10 and laminate. 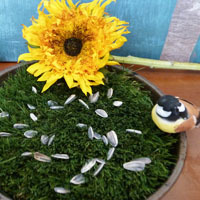 Place sunflower seeds inside a small basket. 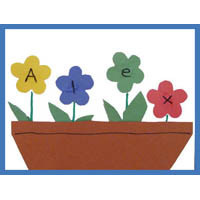 Let children count and place the matching number of seeds on each pot. 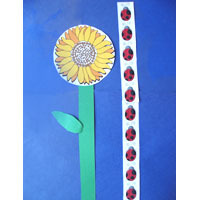 Cut out a brown circle and 20 yellow flower petals out of craft paper. 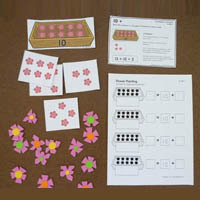 Let children roll a die and pick the matching number of petals from their flower. 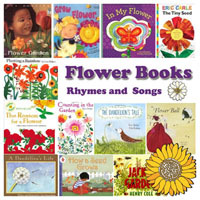 Show children a selection of flowers that have different fragrances. 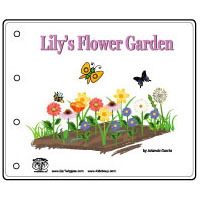 Let them smell each flower and make a chart of their favorite flower smell. Go on a walk and collect some flowers. 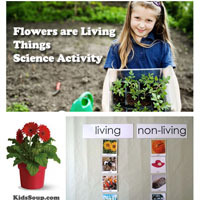 Explain to children that the flowers will wilt and die quickly after being picked. Tell them that to preserve their beauty, we can press the flowers. To preserve the flowers they need to be completely dried out. 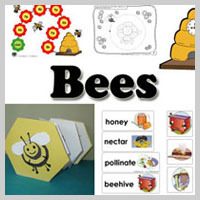 Have children choose two or three flowers to preserve. Write child's name on a piece of newspaper. 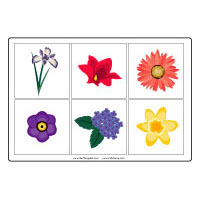 Arrange the flowers face down on the paper without overlapping. Cover the flowers with another piece of newspaper. Carefully place them inside a heavy book such an old telephone directory. Allow flowers to dry for at least two weeks. At the craft store buy small ribbon rosebuds in a variety of colors. Use a muffin tin to sort by color or count them or make patterns. Print sunflower pattern and cut out. Trace onto craft paper. 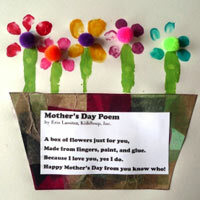 Have children glue a variety of seeds onto flower. 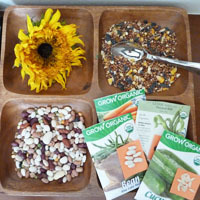 Show them how to get different effects by using one kind of seed for the center of the flower and another kind of seed for the petals. Have children color the stem and leaves green. Mix popped popcorn in paper bag with colored tempera paint and shake. 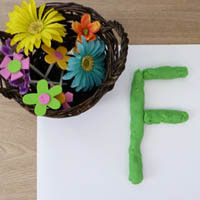 Have children draw a stem and leaves for their flower on construction paper. 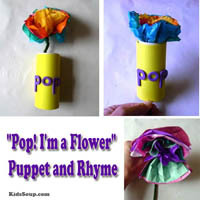 Glue popcorn on paper for flower petals. 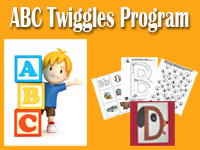 Give each child 3-5 coffee filters or tissue paper. 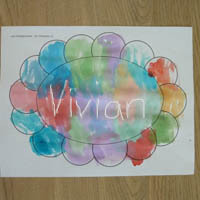 Have children color (decorate) them with magic markers (or watercolor paints). 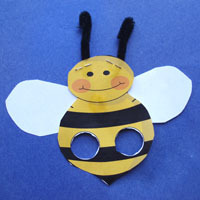 Once children are finished decorating, lay the coffee filters on top of each other and gather them in the center. 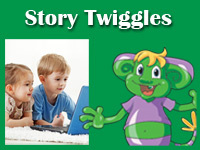 Twist a green pipe cleaner around the center for a stem. Display bouquet in a vase. Cut oranges and apples into thin slices, slice bananas, cut celery into long strips, and cut green grapes in half. Give children large plates and show them how to arrange fruit to build a flower: apple and orange slice for petals, banana slice for centers, celery for stem, and green grape halves for leaves. Then give them a few sunflower seeds to put in the center of their flower. Cover a half of an English muffin with peanut butter. Add sliced bananas around the edge. Then, add a few raisins or shelled sun flower seeds in the middle.